Penguin Publishing continues their series on European history with this excellent new volume by Professor Richard Evans on the critical 99-year period from the end of the Napoleonic Wars to the outbreak of World War I. Long considered to be the zenith of European power and culture, this was a turbulent time of transition from the Napoleonic era that upset the European dynastic landscape to the modern tableau of nation-states that created both the greatest increase of global wealth in history and the fertile ground for the bloody 20th century. Writing a sweeping narrative history such as this presents a tremendous challenge in deciding what to include, what to exclude, and how much detail to provide for each topic. Professor Evans manages this balance of breadth and depth exceptionally well, packing a great deal of material into the nearly 900 pages of narrative without getting bogged down in excessive detail. The range of topics covered in this single-volume history is varied and covers nearly every aspect of European life, from the expected discussions of wars, revolutions, and political changes, to less considered topics such as the eradication of diseases that often swept through towns and villages killing thousands, the beginnings of the suffrage movement and the expanding of the franchise in many countries, to the beginnings of an environmental movement. In addition to the well-done narrative, Professor Evans also does an admirable job of linking cause and effect for events in new and interesting ways. The book starts right off discussing the post-war wreckage in Europe after Napoleon’s final defeat and exile, noting that the usual post-war traumas of hunger, displacement, and destruction were exacerbated by the “year without a summer” caused in 1816 by the eruption of Mount Tambora in Indonesia. The effects of the world-wide climate disruption hit Europe particularly hard, ruining successive harvests and causing the last great food crisis in Europe as crops of all kinds were hard hit. The downstream implications of the hardships Europeans faced trying to rebuild after nearly 25 years of constant warfare are told in sympathetic terms, laying the groundwork for the many societal and political upheavals of the next half century. All of these topics are covered with tight and well written prose, and Professor Evans in particular does an exemplary job of chronicling and analyzing the many wars and conflicts that occurred during this era of so-called peace. The Crimean War, the Wars of German and Italian Unification, and the lesser known conflicts between Russia and Turkey and among the Balkan states are placed in the context of larger European politics and nationalism, providing an excellent background to the military and diplomatic developments that led to the division of Europe into two competing alliances prior to 1914. Two very controversial topics, the imperial growth of the era and the virulent nationalism before World War I, are covered without hyperbole and provide the all-important context to understanding the relationships between and how they contributed to the ultimate outbreak of World War I. Imperialism and its attendant racism are difficult topics to cover. The author pulls no punches and highlights that the “white man’s burden” associated with the era often encompassed a dark side of near genocidal efforts to control native populations for economic exploitation. The rise of nationalism associated with ethnic, religious, and racial animosity also shows a dark side to this era of European history. The eventual division of Europe into two armed camps in the last twenty years prior to 1914 and the associated brinksmanship of various crisis shows just how dangerous the situation was prior to assassination of Archduke Ferdinand and why a seemingly small crisis in the Balkans quickly escalated into first a European, and then a World War. 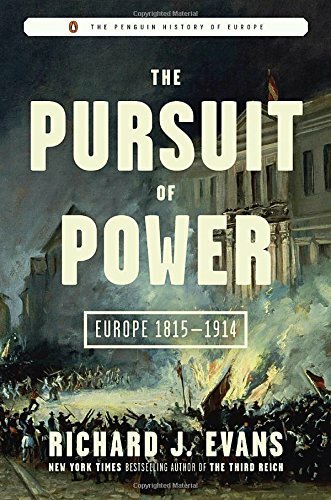 This is an outstanding volume that leaves no stone unturned in providing a taut narrative of this important era of modern European history. Using dense and well written narrative and cogent analysis of cause and effect, Professor Evans has provided another excellent contribution to this series.